Last night I went to a family’s house for a party, and there are four sisters ranging from 5th grade to college. One of the sisters was wearing a cute jacket, and at one point all the other sisters started saying it made her look like a wise owl. You can tell they’re all close, and they have that ‘sister bond’…It made me think so much of me and my sisters. 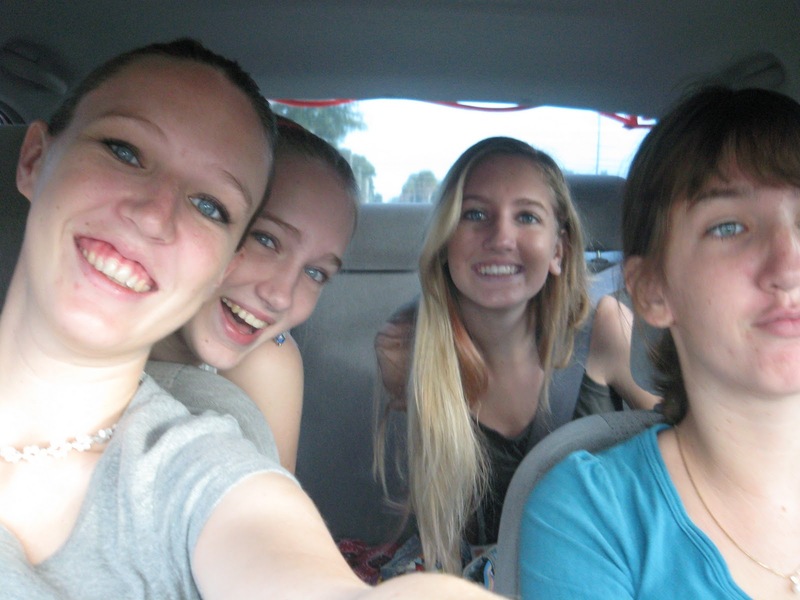 Spending most of last week with my family in Florida reminded me of how much I love have sisters. I’ve gone shopping with Adam a few times and…it’s not horrible. But there is nothing like shopping with your sisters, or having your sisters there on Sunday morning to tell you if your church outfit looks cute yet modest. I found some cute maternity clothes at Ross on Black Friday, and my sisters sat outside the dressing room door as I tried them on, opening the door and asking for opinions for each outfit. You can be sure a sister will be honest! Like when I walked out wearing maternity leggings with a shirt that was no where near long enough to wear with leggings. The best was when I walked out with my maternity full panel pants on and a shirt I was trying on, and my sister Caley said ‘The only problem is that it makes it look like your pants come up to here (pointing about 4 inches above my belly button)”. I replied by lifting up the shirt and saying ‘You mean like this?’. That got some squeals and looks of shock! Hopefully, they will all be more prepared now for the day when they have to wear maternity clothes! I also realized that I laugh more with my sisters than with anyone else in the world. Somehow we all just ‘get’ each other’s humor…I’m sure it has to do with growing up together, and with the same mom and dad, who also have quirky senses of humor (especially dad!). The difficult thing is that when you try to explain that oh-so-hilarious conversation to anyone else, it just drops…no one else usually gets it, except maybe our brother. Angel, my youngest sister, was the driving force behind my baby showers last weekend…which were amazing, by the way! Probably one of the best baby showers I’ve been to, and not just because I was the star of the show. (-: I love seeing how different all my sisters are, but how they work together so well. I really almost wished that the shower wasn’t for me because I wanted to help so much (I did help a little, but the organizing part was up to Angel, and that’s the part I like!). I plan on having several more kids, and I know I’ll love them all the same whether they are a boy or girl. But I can’t help hoping/praying that this baby girl will get at least one sister…they’re the best!